Whilst quite a lot of media space is currently being devoted to talking about the study by Rich Stoner and colleagues  and sweeping generalisations like the BBC headline: Autism 'begins long before birth' with seemingly only little appreciation of the small-scale nature of the study and little details linked to samples being post-mortem tissues, other important autism-related news is also out there. 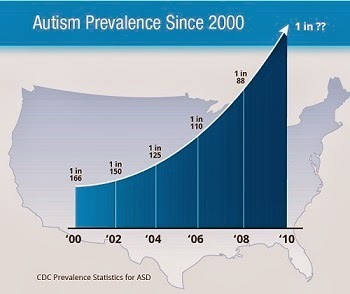 I'm talking about the latest autism prevalence estimates from the US CDC (Centers for Disease Control and Prevention) for 2010. Back in 2012 (has it been that long?) I talked about the publication of the estimates based on the 2008 surveillance data which highlighted an estimated 1 in 88 children presenting with an autism spectrum condition . That the latest figures further revise upwards the prevalence estimates follows a trend over quite a few years now as per the graph included in this post taken from the Autism Speaks coverage of this news. The intervening years have seen other reports talking about increased prevalence estimates for autism as per reports here and here and here both in the US and other parts of the world, taking into account factors such as ethnicity too. In light of these estimates, some of which talked about 1 in 48 children with autism I don't think anyone should be too surprised by the latest CDC estimate. As per my 2012 post on the 1 in 88 figure, I'm sure that the latest CDC estimates will generate further discussions about the hows and whys of the increasing numbers of children being diagnosed with an ASD. I'm willing to take on board arguments about better awareness and improved diagnostic vigilance as accounting for some of the change, but those factors only go so far. Yet again, I'm going to link to the Nature piece from Karen Weintraub  on the autism prevalence puzzle and how blanket commentary like 'we're just better at diagnosing autism' is starting to wear a little thin particularly in light of the continued reliance on DSM-IV criteria in this latest estimate. Perhaps now is the time to start further widening the research agenda when it comes to the question of what is driving the increase in cases of autism to include a few additional points: (a) that autism is probably a plural condition, so 'autisms' over autism which is exquisitely exemplified by the recent BCKDK research, (b) genes and genetic influences are [variably] important to the autisms (see previous point), and (c) genes represent our blueprint but are not necessarily our destiny as per the rise and rise of the science of epigenetics combined with the notion that we don't walk around with all our genes permanently fixed to the 'on' position all the time. That final point in particular opens the door to environment - some facets of environment - also variably impacting on genes, the function of genes, and indeed autism and autism risk. And as we've seen in recent times, how perhaps we should be devoting a little more effort to looking at certain external factors [plural and cumulatively] as potentially playing some [variable] role in the increasing numbers of children being diagnosed with an ASD. Stoner R. et al. Patches of Disorganization in the Neocortex of Children with Autism. NEJM. 2014; 370: 1209-1219. Autism and Developmental Disabilities Monitoring Network Surveillance Year 2010 Principal Investigators; Centers for Disease Control and Prevention. Prevalence of autism spectrum disorders--Autism and Developmental Disabilities Monitoring Network, 14 sites, United States, 2010. MMWR Surveill Summ. 2014 Mar 30;63. SS-2. Autism and Developmental Disabilities Monitoring Network Surveillance Year 2008 Principal Investigators; Centers for Disease Control and Prevention. Prevalence of autism spectrum disorders--Autism and Developmental Disabilities Monitoring Network, 14 sites, United States, 2008. MMWR Surveill Summ. 2012 Mar 30;61(3):1-19. Weintraub K. The prevalence puzzle: Autism counts. Nature. 2011; 479: 22-24. Dioxin exposure and autistic traits? Environmental exposure and autism incidence?